Thankfully there seems to be a growing trend in the UK and elsewhere towards high quality independently produced food. Just as farmers’ markets have grown in popularity, online delicatessens offering artisanal products are also springing up; these delights are now much more accessible to those of us who don’t have a fantastic deli just around the corner – it’s a great time to discover excellent products you’ve never heard of before, especially with Christmas just around the corner. I’m all for it. Yumbles is one of these new food sites and its shelves are laden with the kind of stuff I like: sauces, spices, cheese, oil, antipasti, cakes and yes, chocolate. The site is growing rapidly and the range ever expanding. Shopping is made simple, with a clear, easy to navigate menu. You can shop by category, event, gifts for him or her or by collection. I am delighted to be associated with Yumbles in the capacity of chocolate food explorer. I was given a small budget to choose something from the site. Strangley, I went straight to the chocolate section. It wasn’t easy making a choice as there were so many gorgeous items I wanted to try. And they were all good quality, real chocolate. Would it be chocolate Christmas tree baubles, a raw chocolate bar, chai chocolate almonds, rose petal drinking chocolate or a box of chocolates from the cocoa garden? In the end, it was none of these things. As some of you may have sussed by now, I have a particular weakness for salted caramels – you could say I’m a sucker for them. The call went out on social media; could I tell the difference between the salts, I was asked. Well, yes I could. It was hard to put a finger on what the differences were and even more difficult to describe them. I pass on the challenge and leave you to do a better job of describing them than I.
Muscovado Caramel with Malden Sea Salt – heady aroma of rich dark chocolate with a light caramel undertone. A bonfire toffee taste was the first thing to hit the tongue, followed by a medium saltiness and finished off with rich, dark chocolate. Traditional Salted Caramel with Fleur de Sel de Camargue – a soft, but not liquid caramel with a mild saltiness that had a slight tang of the sea. Seaweed was the first word that sprang to CTs lips after he tried one. Palm Blossom Caramel with Himalayan Pink Salt – the taste of raw sugar was very pronounced; it reminded me of jaggery. This one had a slightly more pronounced mineral salty flavour than the others. On a slightly different tack to Yumbles, The Chocolate Society makes all of the chocolate it sells. Established in 1991, it is a small artisan company that creates real fresh chocolates using Valrhona couverture and other fine ingredients. I have reviewed their chocolate covered honeycomb before so knew I was in for a treat when I received a box of Christmas chocolates from them to try. These chocolates were fun to look at with their festive Christmas appearance. Looks aren’t everything though, so I was pleased to find they were also delightful to eat. The warm winter flavours are interesting, but also quite subtle with the various complex notes and tones unfurling slowly in the mouth. They taste like the real thing rather than “essence of”. CT reckoned they didn’t patronise the taster by making the flavours unrealistically powerful – “yes, we do know what orange tastes like”! Neither were the flavours masked by a surfeit of sugar. Similarly to the salted caramels, the packaging was simple and refined; the chocolates came in a red gift box that can easily be reused and was tied with a white ribbon matching the wording on the box. 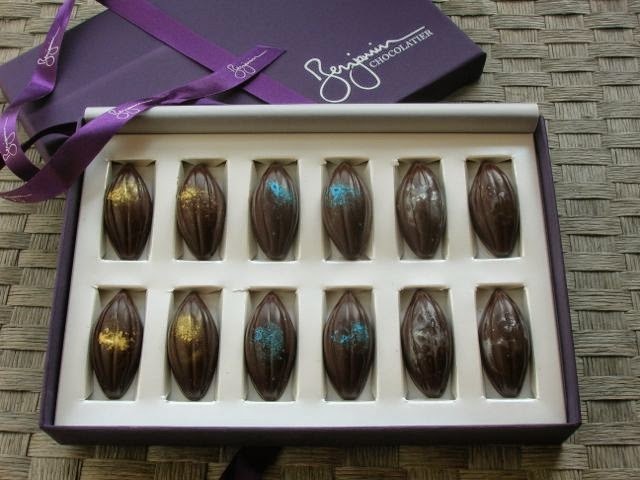 This box of 18 chocolates has something for everyone to enjoy and costs £24.50. Caraway Praline – This was a first for me, I’ve never eaten caraway in a chocolate before. Crunchy praline pieces and dark chocolate ganache gave this an interesting texture as well as flavour. It reminded CT of Eastern European rye bread and we both found it quite intriguing. Cranberry & Morello Cherry – A fruity aroma arose from this pink moussy confection enrobed with dark chocolate. The cherry flavour was delicious and not at all overpowering as is sometimes the case with this fruit. It was also not overly sweet and had a slight tartness from the cranberry. Christmas Cracker – Salted caramel with crunchy bits and popping candy made this one quite surprising, but definitely interesting. Christmas Tree Caramel – This tasted like a subtle mint caramel, which we thought highly unusual. However, when I looked on the website, I found it wasn’t mint at all, but pine needle which makes it even more unusual. Nutmeg – A smooth truffle filling with a fairly pronounced nutmeg flavour, I found this one particularly nice. It reminded us both of egg custard – the smallest egg custard CT’s ever eaten and one of the nicest, he reckoned. Winter Apple – This was pure apple crumble with a hint of cinnamon and tasted as though the clotted cream had already been added. This was one of my favourites. Amaretto Affogato – Tiramisu in chocolate form. It tasted quite strongly of coffee and was multi-layered with cream and crunch. Mulled Wine – This was a very good impression of mulled wine and I’d have happily consumed more than my half share given the chance. CT’s bah humbug comment was “just like mulled wine, but without the interminable conversations that go with it”. Gingerbread – Another delicious ganache that tasted more like lebkuchen than our Great British gingerbread. Chocolate Snowball – This was nice, but compared with the others, nothing special we thought. It had a white chocolate creamy filling with chewy pieces of coconut. Whisky Caramel – There was no mistaking the alcohol and Scottish oaky notes to this one. It got a big thumbs up from both of us. Champagne Truffle – A milk chocolate truffle that really tasted of Champagne – ooh la la. Grand Marnier Truffle – Another one for the spirit lovers, this had a citrus tang. It was fresh tasting with a scent of newly peeled oranges. A new small batch fudge company run by Ed and Jim from a family kitchen in West Sussex is taking our fudge eating nation by storm – or if it isn’t, it ought to be. The ingredients are few with nothing in there for me to disapprove of. Totally Fudged is a great name and a great product. Three flavours, three textures, three mouthwatering sweet fudgy delights. CT and I got to try all of them. Three 150g packs costs £9. Double Chocolate – butter, sugar, milk, salt, evaporated milk, milk chocolate, dark chocolate. A creamy yet firm and chewy fudge which is almost brownie like in texture. It has a good rich chocolate aroma and flavour and it isn’t overly sweet. Containing both milk and dark chocolate, I found this fudge really appealing. This is the least sweet of the three, even though it has a definite caramel flavour. It has a grainier texture than the other two and reminds me of Scotch tablet. It has just the right amount of salt and the brown sugar and white chocolate add to the overall caramel taste. Madagascan Vanilla – butter, sugar, milk, sea salt, evaporated milk, Madagascan vanilla. This is the sweetest of all which is rather too sweet for me. It has a lovely flavour and texture with a rich creamy smell – rather reminiscent of an Indian sweet. Personally, I would be delighted to find any of these in my Christmas stocking. They are all quite special and would make excellent gifts for the discerning foodie. Are you listening, CT? Thanks to Yumbles, The Chocolate Society and Totally Fudged for the samples. I was not required to write a positive review and as always, all opinions are my own. Thanks Jo – I’m feeling rather bereft myself as everything here is long gone. Oh Sea Salted Caramel – I could eat it right now! Haha, yes, sea salted caramel has taken the nation by storm. I love the combo of salty and sweet…that salted caramel will be my favourite! Yes Angie, it seems to be everyone’s no 1 flavour at the moment – definitely mine. You are certainly my ‘go to’ expert on chocolate!! These sound really different! Wish there was a vegan box… I can taste the difference between Himalayan, black salt (who wouldn’t!) and seasalt, but there it ends, I’m afraid…! There are an increasing number of vegan chocolates out there these days and Yumbles features quite a few of them. I adore salted caramel chocs. Totally lush selection of chocolate gifts. Thanks Galina. I’m crossing fingers that more might come my way at Christmas!!! I could do with a few of those in my stocking. Santa you hear me? As I’m typing this, may be time for breakfast but after reading your wonderful descriptions of all these sweet treats I’m thinking that, infact, its time for chocolate!